The invitation is always open: join the weekend hike! But, if you're going to tag along, make sure you wear good shoes and bring water because this is no casual hike. 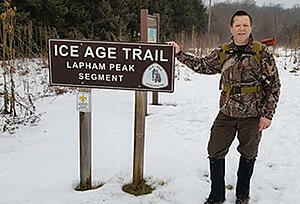 Lemberg Service Manager Tim Hagen has a goal to be recognized by Wisconsin's Ice Age Trail Alliance (IATA) as one of the few who have hiked the entire 1,000+mile Ice Age Trail -- and he's happy to have company along his journey, as long as you show up prepared. To qualify as a "Thousand-Miler," hikers must conquer the entire trail on foot -- hiking, snowshoeing or cross-country skiing. Considering that it takes the average person 20 minutes to walk a mile, that would be 20,000 minutes or 333.3 hours. That's 13.9 days if you're going to walk around the clock. Hagen figures it's going to take a few years. "You walk the entire trail in segments," said Hagen. "I figure it will take me about 10 years since I only walk the weekends." The IATA provides hikers tools for mapping out success, including trail maps and guidebooks, planning help, and backpacking tips. 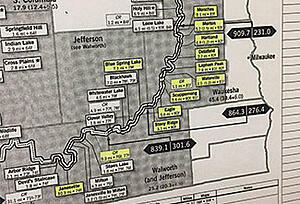 Hanging in Hagen's office at Lemberg is a map highlighted with the segments he's already completed, most of which are close to home in Waukesha County. But he's now moving to other areas of the state. Hagen, a veteran and avid outdoors-man, began the challenge alone in December 2018 with a 6.2 mile trek in Eagle. His journal entries chronicle hikes that range from 2-10 miles each (so far), some accompanied by others, some alone. He notes the mileage, his company, the weather, trail conditions and any interesting facts or adversities he encounters along the way. For instance, during a recent warm and sunny March hike in Kewaskum, Hagen had to add .2 miles onto the hike to avoid an area of the trail that was flooded from spring snowmelt. Hagen began involving his Lemberg team in weekend hikes at the start of 2019. Generally speaking, the group drops a car at the end of the trail before travelling to the segment head so that they have ready transportation back to their starting point. But, make no mistake, this is more than a weekend pastime for Hagen. It's a mission and he's prepared to go it alone. Once, during a foggy February hike in Lapham Peak, one of Hagen's hiking teammates, Matt, felt pain in his knee. Hagen completed the hike alone while Matt hitched a ride to the finish point. Hagen has done his research, gained skills and continues to challenge his new knowledge and skills. "Planning ahead for the terrain, weather, water and food supplies and any emergency first aid items are essential. As the hikes continue northbound, there are some seriously remote areas with a few predatory animals to stay aware of." In April, Hagen will challenge himself to an overnight alone as he extends the length of his hikes to match his growing stamina. Hagen has already seen the health benefits of rugged hiking. "The original goal was to lose some weight to match the weight of my backpack. I have lost 20 pounds so far and looking for ten more. This is a good maximum weight range (20-30 lbs.) for remote overnight hikes and the gear I will need to carry." Hagen has already seen the waning of one season to another. 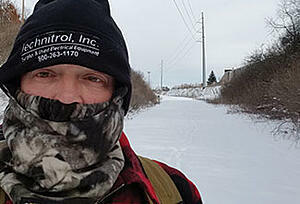 He and his occasional trail-mates have experienced Wisconsin's icy trails, deep snow and sunny spring thaws. Considering that he's completed only 76.8 out of 1140.7 miles, there's going to be plenty more to experience. The Ice Age Trail, a one-thousand-mile scenic footpath that winds through parks, forests, cities and private land across 31 Wisconsin counties. The trail demarks the edge of the glacial ice flow some that left a unique and breathtaking landscape of glacial sculpture in its retreat some 12,000 years ago. Ice Age Trail Alliance (Alliance) honors those who've dared to hike the entire trail. The trail is entirely in Wisconsin from the St. Croix River on the west to Sturgeon Bay on the east. Some areas are rustic and wooded, others run through populated areas and still others are yet to be cultivated. Though the route is meant to be traveled on foot -- hiking, snowshoeing or cross-country skiing -- there are a few areas where biking is allowed. The trail is one of only 11 National Scenic Trails and is managed by the National Park Service, Wisconsin Department of Natural Resources and the Ice Age Trail Alliance, which report an average 1 million annual trail users. The Ice Age Trail was the vision of Milwaukeean Ray Zillmer. You can find a support community of Ice Age Trail hikers on Facebook. Leave a note of encouragement or a question for Tim below. Then subscribe to the Lemberg Blog to get Tim's progress delivered direct to your inbox.